East of Sitia, the main road winds along above the coast, then heads inland through rolling hills. To reach the fortified 14th century Toplou Monastery, take a left before Palekastro as directed by a sign at a conspicuous intersection, turning onto the serpentine road that climbs the hill, offering panoramic views of the valley, hills, and sea before taking us to the parking lot across from the monastery. The monastery’s entrance fee is now 3 euros; opening times may vary depending on the season. Olive groves, vineyards, gardens, and other trees surround the compound. As we walk up to it, the monastery’s massive outer stone walls tower above us, emphasizing its past role as a defensive fortress, its bell tower reaching even higher. Potted flowers, functional dark wood doors and railings, and arched doorways ornament the courtyards. The monastery is dedicated to the Virgin Mary of the Cape and Saint John the Theologian. Toplou’s religious, cultural, and historical significance are evident in its museum, with rare books, maps, engravings, Byzantine icons, embroidered vestments, religious objects, and an interior gateway with peacocks on grapevines. A surprising separate room houses items related to the World War II sheltering of Greek resistance fighters, which followed the monastery’s support for the Greek Independence War in 1821. In the church, with its rich scent of incense and traces of old murals on part of the ceiling, an impressive icon screen and brilliantly colored icons stand out. 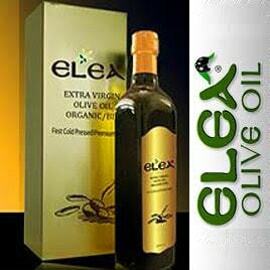 The monks consume many of the products of the monastery’s land, including olive oil when they are not fasting. Visitors interested in wine and olive oil tasting at the Toplou winery can park in the smaller lot down the drive across from the monastery, then walk up to the guard house to ask for the tasting room. On the way to that room, we stroll past the buildings housing the raki distillery and the olive oil production unit, then walk under a grape arbor to enter the winery. Since the production units are ISO certified, visitors may not explore them, but we can visit part of the winery and see the decanters and vinificators, the bottling unit, and the temperature control tanks, on the way to the tasting room. In a cool space dominated by stone, wood, barrels, and bottles, we can learn about the varieties of grapes used, the grape harvest, and the production processes for Toplou’s red and white wines, tsikoudia (raki), whiskey-like aged tsikoudia, and tsikoudia with thyme honey, molasses, and aromatic herbs. All the Toplou wines are organic dry wines, except for one naturally sweet Liatiko dessert wine. Some of their wines are made from the indigenous Cretan grapes known as Liatiko, Mandilari, and Thrapsathiri. Others come from international varieties--Chardonnay, Syrah, and Merlot—or the Assyrtiko grapes native to Santorini. From April to October, the wine tasting room is open from 10:30 to 5, Monday through Saturday; the rest of the year, an appointment is required. Tour groups should always make advance reservations. There is a sliding fee for wine tasting, depending on how much visitors want to taste, but the olive oil tasting is free. Toplou olive oil and wine are also available for purchase. 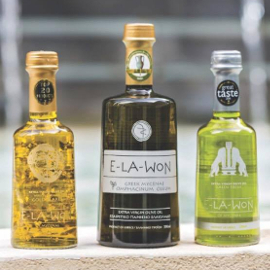 The emphasis is on wine in the tasting room, but olive oil is also part of the story of the monastery, which has made both of these Cretan essentials from the products of its extensive landholdings since the 14th century. For hundreds of years, the monastery produced just enough olive oil and wine for religious and social use, but in the late 1990s they started renewing the vineyards, ending up with so many grapes that they decided to sell their wine. Last year, they produced 200 metric tons of it. 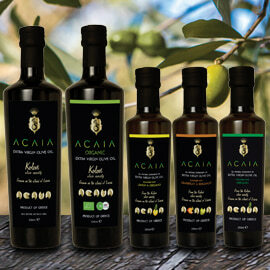 In 1999, the Toplou Monastery teamed up with several dozen organic farmers to establish the Bio-sitia olive oil production and bottling company and began bottling olive oil to sell. 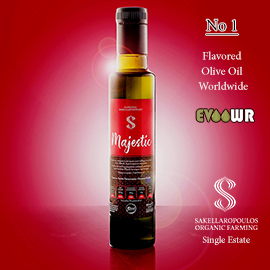 Their products include both conventional and organic PDO Sitia Toplou extra virgin olive oil (EVOO) that is made from olives grown in the area. 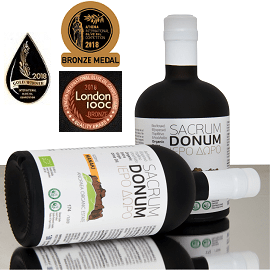 Those interested in learning more about Toplou olive oil can request a discussion with the olive oil production staff, as I did in advance, or consult Bio-sitia’s very informative website. Producing only organic EVOO from the Sitia area in their own facility, Nikos Lapidakis of Bio-sitia’s Quality Department explains, “we buy all the olive oil produced here,” providing a useful guarantee for the organic farmers they strive to support in the environmentally friendly efforts important to the monastery. Thanks to Bio-Sitia for sharing the introductory photo of the entire monastery compound viewed from above. 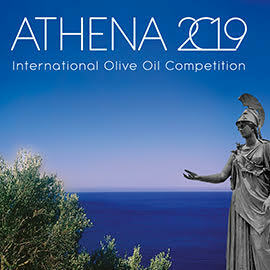 To learn more about agrotourism and food tourism opportunities in northeastern Crete, see also the Greek Liquid Gold article From an Ancient Olive Tree to Local Products in NE Crete.